I rode a chair last season with a couple who got upset when they saw a dead porcupine on the trail below. They “knew” the animal from skiing there for several months. It looked like it had been attacked. 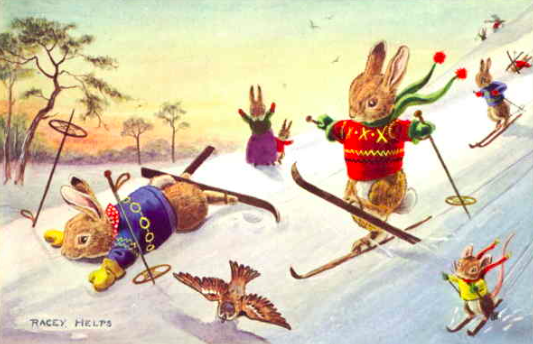 I’ve seen a lot of animals while skiing over the years. Nothing larger than the moose who frequented part of The Canyons. I’m confident that even with Vail’s acquisition of that wonderful area (now part of Park City), the herd still hangs there, occasionally moseying out on a trail . Deer Valley had many weasels and, if I have it right, ermine. The critters are long hot dogs making a slinky wave as they run across trails. I had to swerve more than once to avoid trail-kill. The Catskill and Adirondack areas had occasional deer and lots of porcupines. I remember one tree where the chair passed a porky perched there most of the season. Rabbits, squirrels, chipmunks, birds of all persuasions, an occasional raccoon. They appear on slope and trail. More often it’s their tracks, but look, and you’ll see them. And dogs, especially those trained for avalanche rescues. Bless them for their excellent skills and stellar service. 5:00 – 8:00PM, Wednesday, November 14, Manhattan. 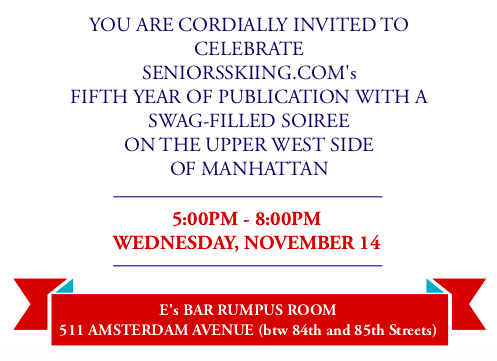 We’d love you to be there, meet other senior skiers, win cool raffle prizes and help us celebrate our fifth. Prizes and SWAG from Apex Boots, 70+ Ski Club, Masterfit, Orsden Parkas, Buffalo Wool Company, Solitude, Powder Mountain, DeBooter, Bootster, GearBeast (the perfect skier’s cellphone carrier), International Skiing History Association, and others. We’ll provide the nibbles. Open bar. If you plan to attend, please RSVP to [email protected] Location: E’s Bar (Rumpus Room), 511 Amsterdam Ave. (bet 84th and 85th Streets), Manhattan. The resorts and state ski associations are reporting snowfall, snowmaking, and opening dates. A few examples: Wolf Creek in southwest Colorado got 20″ and will have limited skiing this weekend. The Utah resorts received more than a foot of snow. One of them, Snowbasin, got its first big dump in September! Opening days at the Utah areas range from November 21 to December 21. Face of Winter is this season’s Warren Miller film, the first since his passing earlier this year. Click here to find when it will be playing near you and to purchase tickets. For six minutes of pure skiing fun, watch Drop Everything, a video of the recent history of extreme skiing in Squaw Valley. Click on the name to get you there. Ski Utah outdid itself with this new, free annual magazine. There 100+ pages. Available in print and digital editions. 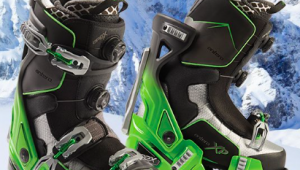 Not your typical ski industry promotional fare. There’s a page dedicated to the wisdom of George Jedenoff, who celebrated his 100th birthday last July with several runs at Snowbird. Ski Utah is essential reading for everyone from regulars to those planning their first visit. To order a copy or send one to a friend click here. 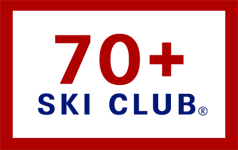 If you’re in the New York area, International Skiing History Association is hosting a free pizza/wine/beer Skiing History Night at Hickory & Tweed (410 Main Street, Armonk). 6:30-9:00 PM, Monday, October 15. Highlight of the evening: ISHA’s Jeff Blumenfeld will present how skiing has been portrayed on TV over the decades. RSVP requested: [email protected]. Several years ago my son and I skied at Kicking Horse in Golden, BC. The Golden Eagle Express chair crossed over a Grizzly Bear refuge (it’s marked on the trail map), which we were told was occupied by a hibernating bear. We never saw him/her, but that’s probably just as well! Horse. Eagle. Bear. What a menagerie! I just saw the Easy as 1,2,3 put your boots on advertisement. It cost 25.00 plus 7.00 shipping to buy the decice. I made one out of a I gallon plastic milk container for nothing. Creative minds always come up with cool solutions. Thanks, Roger.